March 2007. That's when I fell during my first snowboarding holiday and landed badly on my coccyx. To others looking on, it was just a mild fall and, as I was with more experienced snowboarders, they all thought I was making a bit of a meal of it as they had all had much worse "slams" than they'd just seen me have. My boyfriend, now husband, went to the local pharmacy in Andorra and they were not surprised at all as they see this type of injury all the time. They gave him Diclofenac 50 mg and said to take it 3 times a day. Back at the hotel it was agony to sit down, laying in bed was awful as everytime my boyfriend rolled over, it made me move and I would feel a horrible shooting pain in my bum! The following day, I was in constant tears, the transition between sitting and standing was agony but walking around and keeping it moving made it go numb and feel much better. As it was in the first week of a two week holiday, I refused to waste all the money I'd paid so I swapped the snowboard for skis as I'd been told there was a lot less chance of falling directly onto the coccyx with skiing. I had my first ski lesson and cried all the way through it as was in so much pain but was determined to make the best of it. The movement helped to numb it and I continued to take the pain killers. Flight home was a nightmare, very painful. Returned to the UK and immediately booked a doctors appointment. The doctor was very shocked that I'd continue to go skiing afterwards as he would have advised to stay immobile for a few days based on the amount of pain I was in. Anyway, he explained the usual that I read time and time again on here that they are reluctant to do anything except manage pain for the first two years of injury to that area. So, for the first year I remained on diclofenac everyday. Had physio for the first couple of months but this only taught me how to sit and move in ways which reduced the pain. Got a wedge to sit on which made me lean forward slightly as it was very painful to lean back. Rubber rings didn't work. Life wasn't easy, I struggled to sit at my desk at work, I couldn't be a passenger in a car for anything other than short journeys although being a driver was much more bearable weirdly. I couldn't sit on the floor, couldn't go on picnics, sit on the sand, deckchairs, stools, bikes etc. Friends started to become a bit weary with me - especially as those on the holiday still thought I was making a bit of a big deal about nothing. After a year of this, I was referred for corticosteroid injections. This involved a local anaesthetic first, then the injection directly into the coccyx. The first one didn't really have any effect which, when I returned to the Doctor, he explained that because I had not relaxed enough, it had not been injected into the correct place - very difficult to relax when laying on a bed with a stranger trying to get you to relax your naked bum so he can put a giant needle in it!!! Anyway, second one worked a charm and although still twinging, had about 3 months of being much more bearable. I had injections every 3/4 months for the second year after injury. In March 2009 I went for another injection but when discussing the condition with the doctor, it had been two years and other than pain relief from the injections, there had been no improvement to my quality of life. The doctor wanted to refer me to the hospital for further tests, x-rays etc as it should have subsided by now if it had just been bruised. Great. However, he would not give me another injection as the consultants at the hospital would need to see me "in pain" to fully assess me. So, having not had an injection since December 2008, I had to wait until July 2009 before being seen by the consultant at the hospital. I had x-rays which didn't show anything at the angle they took it and it was too painful for him to try and feel the bone (use your imagination for how they would do this!). They then said they would need me in for day surgery under general anaesthetic to manipulate the bone to see if this relieves pain, as well as take a few more x-rays under different positions. Still was not allowed a steroid injection!! Very depressed by the whole situation. I had changed careers during this time and was now training to be a primary school teacher. I couldn't teach PE, could not sit on the carpet with the children, couldn't sit on hard chairs in assembly and parents evening - very difficult. January 2010 got appointment for day surgery, was cancelled due to the very bad snow we had that week!! April 2010 finally managed to go in. They gave me a steroid injection while I was under general. Didn't get to speak to consultant afterwards, was told to wait for a letter calling me in for results. Was in and out in 8 hours with no ill effects but can't say I felt much relief from the manipulation, just the usual from the injection. Should I get infection, recovery time could be longer - months. They remove the dressing, and have to leave the wound to heal from the inside out. If no infection, recovery could be slightly quicker. I decided to go ahead but trouble was, I could not afford to take time off for recovery during term time as it would mean I would not pass my teacher induction year! I pleaded with them to get me in during the 6 week holidays of 2010 but they said it was more likely to be Xmas. No way I could do this so they suggested taking me off the list then putting me back on at Xmas 2010 to get in for the summer 2011. Arrrgggghhhhh!!!!!! This then has drastic knock on effects for planning a family. Tuesday 27th July 2010 9:15am. Phone call from the consultant's secretary: We have a cancellation, we can get you in earlier for your operation. It's tomorrow!!! Decided to go ahead. Fitted in perfectly as it was the start of the six week holiday!! No time to worry and fret about it, just had to pack a bag and be at the hospital at 11am the following morning. They said to pack for two nights but most likely it would only be a one night stay. Saw the consultant and his team at 2pm on day of surgery, they re-iterated the risks and benefits, explaining could not guarantee pain free but fact that steroids worked was a good sign. Recovery would be very light movement for first couple of weeks, risk of infection was high etc. Main point he made was the fact that bowel movements would feel "different". Basically, they would remove the sheath around the coccyx which is attached to the sphincter muscles, take the coccyx out, then repair the sheath. This meant that it would feel different but body would adapt. Met anaesthetist who explained that they would put me under laying on my back but in theatre, they would turn me over. This meant I might experience aches in my arms, which would be placed over my head, and my neck from my head being in a hole on the operating table. I may also have a catheter fitted to help me pass water in the first day. When I woke up from surgery, I was in an enormous amount of pain at the wound site. They gave me morphine which didn't help. Had to give me an awful lot more which eventually numbed the pain but felt very sick and dizzy. They moved me from recovery to the ward. The morphine meant I was quite out of it but I realised I didn't have a catheter fitted. When I needed the loo, they offered me a bed pan but as I was so conscious about risks of infection, I was determined to use the loo properly - was far too dizzy to go far so had to use the commode. Very undignified! Didn't sleep very well, despite the morphine. At 6 am, had to ask for more pain relief. Gave me oramorph (liquid morphine). Didn't want to eat any solids for breakfast as was very conscious about going for a number 2. Spoke to Dr at about 9am. He explained that morphine can cause constipation so he was going to prescibe tramadol (based on morphine, can give hallucinations but less likely constipation), paracetamol and diclofenac. I asked about going for number 2 and he said I could also take stool softener to make the experience less painful. Spoke to the consultant's registrar later who said surgery went very well. They had removed about 2 inches of the coccyx and the would site was about 2 inches long but they had been able to make the incision higher up meaning it was further away from my, as he called it, "dirty area", reducing infection risk. I stayed in for 2 nights as still needed the oramorph to tackle the pain. Friday afternoon, the nurse showed my husband how to change the dressing. They gave him dressings, saline solution capsules and swabs. Explained to change the dressing should it get dirty or start to peel away on it's own. Probably every 2 days. If my husband had not been able to do it, they could have arranged for a district nurse to come over. Physio visited me to show me best ways to get in and out of bed, checked my movement walking, and test my ability to go up and down stairs. Was very exhausting as a combination of the drugs and low blood pressure meant I couldn't do very much. Occupational health also visited me to see if I needed any special equipment. They recommended an attachment/frame for the loo which fitted over the pan to raise the sitting height by about 6 inches and had handles on it to allow ease of getting on and off. Just needed to return it when I no longer needed it. Went home that afternoon, laying on my side in the fully reclined car seat. Took the constipation tablets so first time I went for number 2 it was very loose - and felt very weird. With subsequent movements, I felt like I didn't have the strength in the muscles to "push". I have gotten used to this, as the consultant had explained, am able to go the the loo properly but the only thing I can't feel is the sensation you get when you have finished your bowel movement. Am hoping this returns or at least I can adapt to it as it's quite frustrating. Am able to "push" now though. 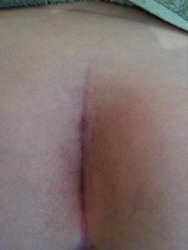 It's now 5 days after the op. I can feel the wound pulling slightly when laying on my side so laying on my front or standing is much more comfortable. I can eat at the table by kneeling on a beanbag! Having seen some pictures on this site, I was expecting a red angry wound and bruising. Not the case. Was a very neat, tidy, small slit and no bruising. Have had dressing changed, no signs of infection, very little blood on the dressings. Things to look out for with infection is weeping/discharge of a funny colour, strange odour, redness, fever. Can walk at a relatively normal pace now but can't bend down or sit. To avoid getting dressing wet, I shower my front and hair, then husband gives me a strip wash on my back and helps me out of the shower. I'm still on the tramadol but reducing the dosage over the next couple of days so I'm just on the diclofenac. Tramadol makes me very drowsy and hot so I'll be glad to finish it - although it is a very effective painkiller. Am due to see consultant in two weeks. I'm very hopeful for the success of the operation. Noticing the gradual improvement day by day. I wish this had not taken so long to do. 3 years and 5 months since the injury. This silly rule of not doing anything for 2 years for this type of injury as "there is no point" is ridiculous. My advice would be to get on the injections as soon as possible! Make sure the doctors know how much pain you are in and how your quality of life is effected. A lot of friends have been very sheepish and admitted they thought I would often exaggerate my injury but having seen the amount I've gone through to resolve it, they understand now how much pain I was actually in!! I'll update in a few weeks.